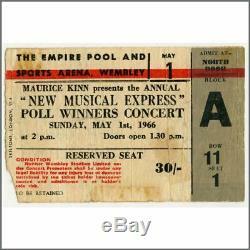 An original concert ticket stub from the New Musical Express Poll-Winners Concert which took place at the Empire Pool, Wembley on 1st May 1966. The Beatles performed at the concert, as did the Rolling Stones, The Who and Dusty Springfield amongst others. The stub is for seat 1, row 11 in block A. It measures 11.5cm x 7.5cm (4.5 inches x 3 inches). There is creasing throughout and some discolouration. A small part of the lower left corner is missing. Near mint = Almost like new with one or two very minor flaws. Excellent = Minor wear yet looks attractive and is perfectly usable. Very Good = Some wear and tear but overall presentable and usable. Good = Apparent wear and tear but with obvious deterioration of the condition. A plus or minus after the grading indicates that the condition is marginally higher or lower than the stated grade. The item "The Beatles 1966 NME Poll-Winners Concert Ticket Stub (UK)" is in sale since Friday, January 25, 2019. This item is in the category "Music\Music Memorabilia\Artists/ Groups\The Beatles". The seller is "tracksuk" and is located in Chorley.